The idea that Queen Victoria learnt to speak and write some Urdu, and that her dead body was prayed over by an Indian Muslim with whom she developed a deep relationship in her final years will surely have so-called British nationalists protesting outside cinemas when Victoria & Abdul is released on Friday. The first half hour is quite farcical as “two Hindus” (as they were incorrectly referred to) are chosen for their height and dropped into the aristocratic nightmare of the royal household. Ali Fazal plays Abdul Karim who catches the eye of Queen Victoria (Judi Dench) and begins to offer her a window into the furthest reaches of her Empire, introducing new cultures, customs, history and languages. He is loquacious, forward, and the antithesis of the stiff and proper power-crazed social climbers who normally surround the ageing Sovereign. The tone changes, much to the chagrin of her courtiers and son ‘Bertie’ (played by a pompous and petulant Eddie Izzard), as favour is bestowed upon the chatty, rule-breaking Abdul who coaxes the widowed monarch out of her depression and stirs her spirits. Later scenes document the influence Abdul exerted – deliberately or unwittingly – over Queen Victoria and her inner circle’s fight back against the servant now referred to as ‘the Munshi’ (teacher). 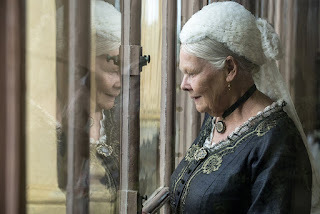 Judi Dench is beautiful to watch as a childlike enthusiasm is injected back into the bones of the short, overweight, cantankerous ruler. Tight close-up shots allow Dench’s head to fill the full height of the cinema screen, leaving the audience to stare into the monarch’s eyes and perhaps her very soul in a way that they will never get the chance to again. The ambiguity of her intentions towards Abdul remain up in the air right until the resolution in a final scene. Yet whatever those intentions, the chance to once again be able to freely laugh and chat and learn is a very precious gift of intimacy the Queen receives late in life. The supporting cast add a lot of fun and even some laughs to the tale. Abdul’s travelling companion, Mohammed, is unimpressed with his trek across the world to serve the oppressor of India, and I half expected Adeel Akhtar to don an eye patch and revert to Wilson Wilson from Channel 4’s Utopia! The supposed historical arrogance of the Munshi is played down in Lee Hall’s screenplay based on Shrabani Basu’s 2010 book. Instead the racism, classism and narrow-mindedness of the royal court becomes the emphasis as director Stephen Frears portrays a progressive Victoria battling to hold onto power against treasonous staff and heir who think nothing of humiliating the woman they claim to serve. The film speaks into 2017 with its tale from the late 1800s. It’s as if Frears is staging an intervention, asking us to rethink how we relate to others (and how we view the role of the monarch). The story of Victoria & Abdul is whimsical albeit bedded in truth. It’s worth watching for Judi Dench’s performance: her playfulness, her impatience and her rage. To be frank, everyone else is amusing to watch but they shouldn’t expect to win awards. This is Dench’s film. Victoria & Abdul is released on Friday 15 September and being screened in Movie House cinemas as well as the Queen’s Film Theatre and other venues.